Many visitors to Meetinghouse Farm ask about the Cape style structure that abuts the Farm. Known locally as the Paine Black House, the building was at one time part of the larger Conant parcel but is not currently part of Meetinghouse Farm. 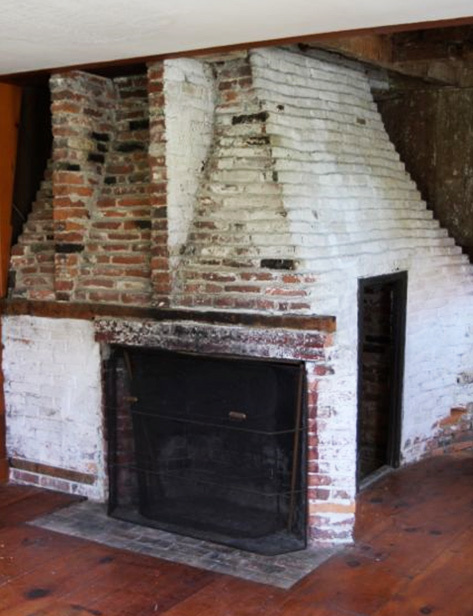 Considered historically significant, the pre-1800’s house contains interesting features including a central beehive oven. Currently in need of repair, the Town of Barnstable is exploring options for improvements and appropriate uses. Currently in need of repair, the Town of Barnstable has appropriated funds to improve the property. The Paine Black House now has a new roof and chimney. It has been resided and the electrical and heating systems are being repaired. Windows and doors will be restored. Significant improvements are underway in the interior. Future community uses for the Paine Black house are being discussed with the support of Town Councilor Phil Wallace and other village organizations. 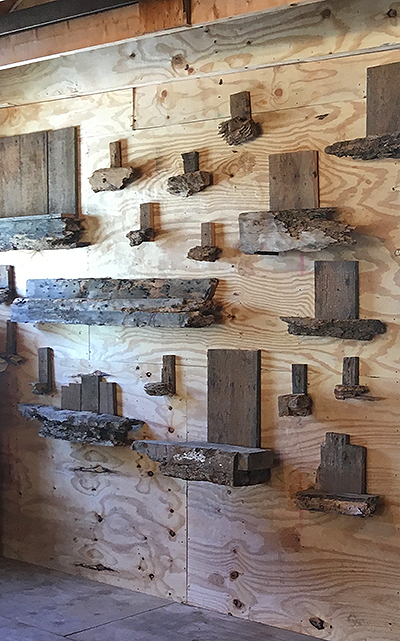 The 2017 Meetinghouse Farm Fundraiser art at the farm featured unique wooden wall pieces crafted from materials generated from repairs to this historic structure. 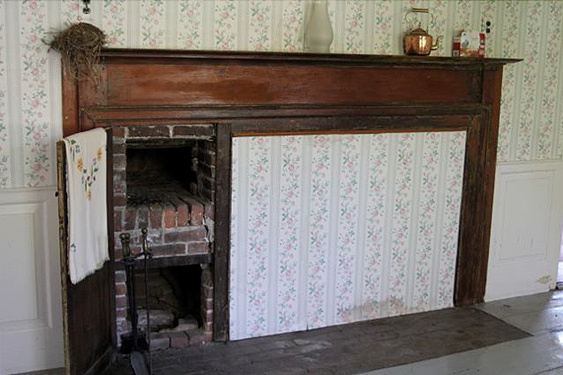 The interior features of the Paine Black House promise aesthetic and educational opportunities during the continuing restoration process. Repairs are underway at the historic Paine Black House in West Barnstable. The restoration work was funded in the town’s 2015 Capital Plan. The work follows repairs made to the barn at Meetinghouse Farm which was originally on the same property as the Paine Black House. 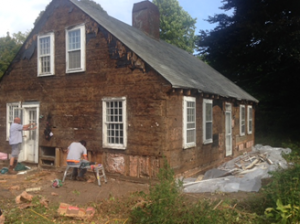 Crews begin restoration work to the Paine Black House in West Barnstable. An answer for what to do with the historic, town-owned Paine Black House on Route 149 in West Barnstable may be found at the “bare and bended arm” of Cape Cod. Way out in Provincetown is Race Point Lighthouse, a tiny complex of buildings huddled on a sand spit: lighthouse, keeper’s house, whistle house, oil house. From here, keepers helped mariners avoid a treacherous fate. People come from all over the country to stay in the keeper’s house with its old-fashioned kitchen, a porch with rocking chairs, and three rooms for rent upstairs. An actual keeper, in this era from an organization dedicated to the preservation of the place, is present, but not obtrusive. If you want to sleep until noon and go out for a walk in the dunes and come back after sunset, no one will complain. The keeper’s house didn’t get into the shape it’s in overnight. Many volunteer hours went into restoring the building, and into creating power options for it by installing wind and solar facilities that somehow don’t detract from the antique feel of the place. Jim Walker of Hyannis was among the prime movers of this effort. With the growing emphasis on eco-tourism, of people coming to the Cape who want to experience more of what it means, and meant, to live and work here, Race Point is a beacon that draws attention. There’s an effect on Provincetown’s downtown as well; people who stay at the lighthouse come back into town afterward for lunch, shopping, and strolling through civilization again. The future of the Paine Black House could involve following the Race Point model. The house is right next to Meetinghouse Farm, which volunteer labor has transformed into a showplace of growing things. It’s across the street from a fire station, guaranteeing plenty of attention and assistance for anyone staying at the house. It’s just down the road from the 1717 Meetinghouse and not far from playgrounds and ball fields and Whelden Memorial Library. Imagine a group called Keepers of the Paine Black House. They would be architects and builders and historians and plain old grunt-work volunteers in love with history and with sharing it. With the town’s support, and with a lease or some other arrangement, they could bring it back to habitable condition and then rent it to eco-tourists interested in history, farming, or just enjoying a place and a village that has remembered, not that time has forgot. It’s a big project, but one worth talking about. If it can succeed, it could bring new life to other historic and otherwise special properties around town. All it will take is time, effort, and love. CAUSE FOR ALARM – Judy Desrochers, president of the Meetinghouse Farm board, describes the deteriorating condition of the Paine Black House next to the farm at the historical commission meeting last week. Commission Chairwoman Jessica Rapp Grassetti and member Len Gobeil are listening. 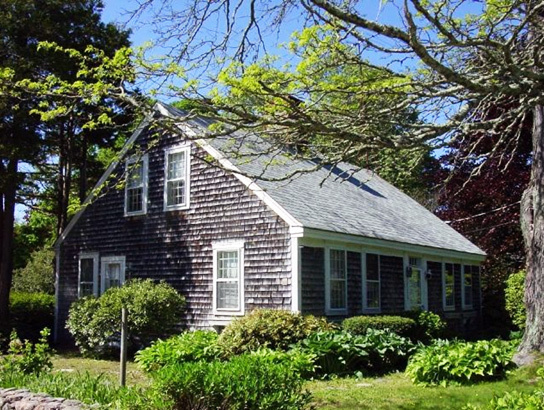 The discussions around the 18th century Paine Black House in West Barnstable have been like a revolving door, and once again the town historical commission is ready to open that door. 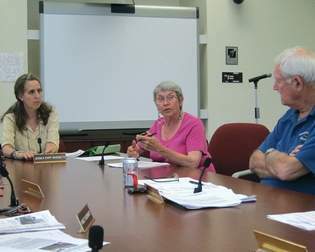 Commission Chairwoman Jessica Rapp Grassetti noted at a meeting last week that there have been five years of conversation about what to do with the deteriorating town-owned house on Route 149 next to Meetinghouse Farm. The house has been called “museum quality” by a town consultant. Jo Anne Miller Buntich, director of the town’s growth management department, provided some historic background on the building, saying its use is limited because it is on a nonconforming one-acre lot and the town requires that it be used for educational purposes. “The town manager has made no determination about the property,” she said. She invited Judy Desrochers, president of the farm’s board, to the table to discuss the issues with the commission. Desrochers confirmed Rapp Grassetti’s comments. “The mold is literally dripping from the ceiling and walls,” Desrochers said. She has taken it upon herself to open up the house occasionally to air it out and mow the lawn, but Rapp Grassetti urged her not to go into the house, for health and liability reasons. Desrochers said that at one point it looked like the town was interested in connecting the house to the larger farm property. “The farm has been a regular respondent about this property,” she said. “We have an interest. We hope the property will be reconnected to the farm,” she said, noting its mission is horticulture education. “Our frustration has been we feel caught in a revolving conversation over a long period,” Desrochers added. She said the farm’s concept has grown over 10 years and she sees much potential in the next 10 years for horticulture education. She expressed hope that the town would see the potential of the house as an educational resource. Otherwise, Desrochers concluded, the house should be sold or demolished. “Something has to be done because it’s literally disintegrating,” she said. Commission members agreed. “You’re watching a building die,” Nancy Shoemaker said. She suggested a nonprofit organization or an individual should be enlisted to take care of the house. “We find this building is historically significant,” member Laurie Young said. Rapp Grassetti suggested the commission look into applying for community preservation funds to pay for an assessment of the house. Shoemaker asked if the commission could get permission to enter the house to document its condition. Buntich said it could. The last time the commission walked through the house was in November 2008. Buntich said she would find out who the most appropriate person would be to discuss policy direction for the property with the commission at its next meeting, on July 16. Town Councilor June Daley is planning to attend the meeting and is encouraging others to do so. Daley wrote that she has “lobbied the town manager to prioritize the preservation of this precious property.” She said Meetinghouse Farm would be a good steward of the property. Thank you for your recent editorial regarding the disposition of the historic Paine Black House in West Barnstable and its possible use as an ecotourism destination. As you noted, the Paine Black House abuts Meetinghouse Farm. Over the past decade, volunteers who have worked to improve the Farm have been saddened by the deteriorating condition of this once charming property. Although discussion about the structure appears to be ongoing among relevant town departments, the cost of repairs, legal complexities and differences of philosophy about the disposition of unused town properties seem to preclude any progress. In 2011, Meetinghouse Farm was the only respondent to a Town Request for Proposals for the Paine Black House. Because we have always believed the Paine Black House should functionally and aesthetically be reconnected to the surrounding Farm property, we proposed a partnership with the town to begin repair of the structure to support Farm and community events and in the long term provide seasonal lodging for a Farm caretaker. Although our proposal was not acted upon, we continue to hope that this structure will not be lost. Perhaps renewed public attention and creativity will generate the community interest necessary to save this historic property. The Race Point Light House is a great example of what citizens can do, as is the work done on our own Sandy Neck Lighthouse. 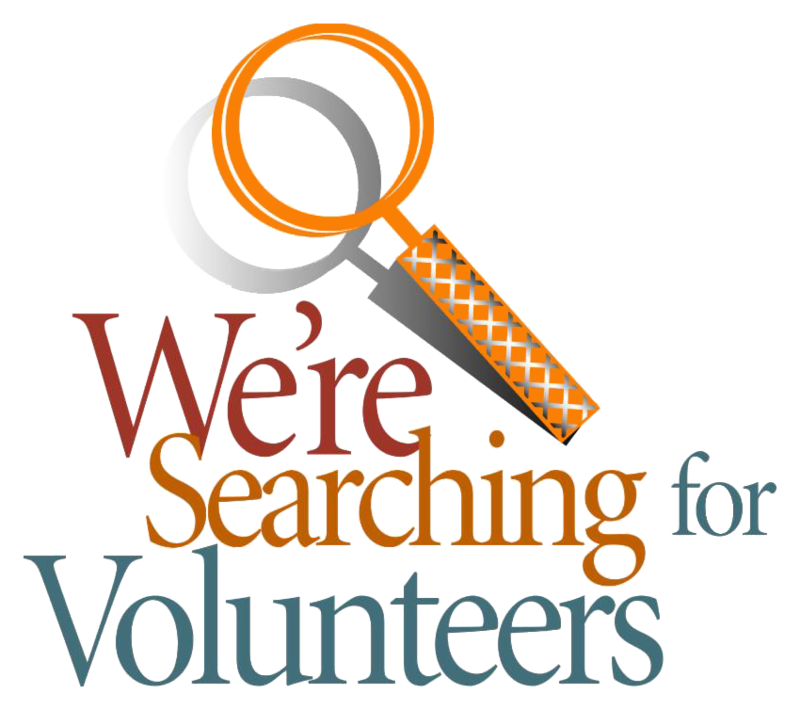 In fact, you don't have to look very far, to find examples throughout the Cape of historic properties that owe their survival to the love of history and passion of community volunteers. Let's hope "Keepers of the Paine Black House" will come forward. This unique piece of Barnstable's history is being lost day by day.